Women, Emotions, and Apologetics: A Response to “Apologetically Blonde” | J.W. 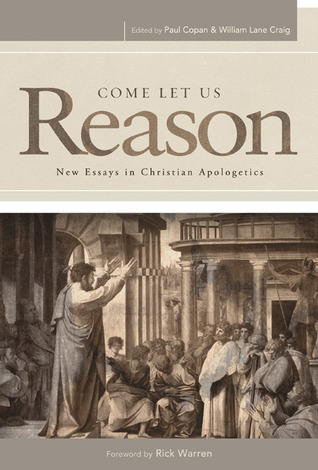 Wartick -"Always Have a Reason"
I recently came upon Come Let Us Reason: New Essays in Christian Apologetics, a book I’d been meaning to read for some time. I decided to take a break from the unpacking I was doing to do a little browsing as my son crawled around on my lap. I turned to the index to discover an article entitled: “Apologetically Blonde: The Struggle of Women to Defend Their Faith and What They Should Do about It” by Toni Allen (full citation below- all references to this text). As I browsed the article I knew I needed to write a response, because–with apologies to Toni Allen–I felt much of it was misguided. Throughout this section, Allen affirms the reality of personal experience and emotions as a basis for believing, but continually asserts that rational reasons are required in the public defense of Christianity. It is difficult to pin down exactly what Allen’s critique is in this section, because the wording is such that it could allow any number of exceptions. Words like “typically,” “often,” “includes,” and the like allow for broad interpretations of her meaning. But it does seem like the whole tone of the article as a whole is that emotions are somehow inadequate as a defense of the faith or that they are opposite or opposed to reason. This latter point is particularly problematic, and it seems like it is closest to the way Allen is leaning throughout the essay. The reason I say this is because emotions are set up not alongside reasons and rationality, but rather as something separate from them. But this is itself mistaken. As any number of authors have pointed out, emotions themselves are part of the reasoning process and indeed can be integral or even essential to rationality. For example, Daniel Westberg argues in Renewing Moral Theology, a Thomistic approach to ethical theology, that emotions are a central part of the process of reasoning and judgment (see especially 40-43; see also my review of the book here). If Westberg is right, then for Thomists–a formidable bunch of philosophers indeed–emotions are a central aspect of reasoning; not something separate from and possibly antithetical to it. But even if he’s wrong, his case is fairly persuasive that emotions should not be dismissed from the reasoning process, and philosophers of several other flavors have agreed. Thus, one of the major points of Allen’s assessment is itself mistaken because it operates from a false understanding of the relationship between emotions and reasoning. As an aside, Allen’s assertion that “we must realize that appeals to religious experience typically do not function as a decisive apologetic” (41) is shifty in its wording (“typically”) while also being mistaken, as philosophers like Richard Swinburne, Caroline Franks Davis, Keith Yandell, and the like have made the argument from religious experience a powerful apologetic tool. Moreover, people like Alvin Plantinga have argued (persuasively, in my opinion), that we can have a rational basis for belief in God through properly basic belief and religious experience. Lines like these are found throughout the essay with little supporting evidence other than personal experience–itself a great irony given the previous analysis. But apart from this, it fails to take into account that men and women operate on bell curves in regard to emotional–and other–reasoning skills and so making broad statements like these fails to reflect the reality of the spectrum of capacities for either gender. Women, according to Allen, also are hamstrung in their attempts to do apologetics through “their natural inclination to avoid conflict” (37). But again, what does this say about men and women essentially (in the philosophical sense)? Do men who have an inclination to avoid conflict somehow become women or more feminine because of this? If so, in what fashion? And what biblical basis do we have for these kinds of assertions? These and other issues betray a primary underlying presupposition of Allen’s article: gender essentialism. This is a deep topic that I cannot explore thoroughly here, but basically what Allen has–consciously or not–bought into is the notion that men and women operate in largely different spheres with clearly defined cognitive and other barriers between them. That’s why lines like “Women are naturally more cognizant of their emotions…” manage to sneak into the text. But these lines find little argumentative support and again fail to take into account the aforementioned reality that men and women do not operate in entirely different planes of existence–or even emotions. Although Allen generally included lines that allowed for some wiggle room, the overall message was clearly based on this presupposed and unfounded adherence to gender essentialism. A final issue I wanted to mention with the article is the title itself. Although “blonde jokes” have become part of our culture, I think that we as Christians are called to a higher standard. “Blonde” jokes select a specific portion of the population for the sake of ridicule. Though these are often “in good fun” the question is whether such jokes are taken that way and what kind of impact that might have on the people who are, well, blonde. I am not, but it’s easy to see how the use of “blonde” in the title as a synonym for “challenged” could be taken poorly and works against the gentleness and respect we need to display as Christian case-makers. Toni Allen, “Apologetically Blonde: The Struggle of Women to Defend Their Faith and What They Should Do about It” in Come Let Us Reason: New Essays in Christian Apologetics eds. Paul Copan & William Lane Craig (Nashville, TN: B&H Publishing Group, 2012). Thank you J.W. for your extremely grace filled critique of this chapter, as I would not have been so charitable. As a biblical apologist and a person who just happens to be blond, I am tired of anyone making these sort of truly juvenile and stereotypical comments about women. I have been working long and hard to defeat these sort of tropes as put forward by Allen: molds that need to be broken both in the church and in the world. Agree with Lisa Gunther’s response. Although we’re all a product of our genetics, gender, education, experience, and culture, the only fixed characteristics from above list are genetics and gender. We are subjected from a very young age to cultural influences, or conditioning (if you will), but we still choose our responses. An example of the conditioning I’m suggesting can be demonstrated in young men. Since emotional responses such as crying are considered “un-masculine” and usually carries a negative stigma, consequently, adolescent males are chastised for a behavior (like crying) while crying is considered normal among teen girls. There are probably physiological influences that presupposes an emotional, rather than rational, response by humans of either gender. It should be noted that well known, female, world and corporate leaders like Golda Meir, Margret Thatcher, and Carly Fiorina show no indication that their feminine emotions interfered in any way with logic or reason. In the same sense, their male counter parts (Al Gore, Howard Dean, John Kerry, and Neville Chamberland) have demonstrated very irrational, emotional responses. I agree with this post, but just one clarification of Allen’s point: “Apologetically Blonde” is intended as a riff on the movie “Legally Blonde” (itself a wordplay on “legally blind”), not as a minimization of anyone’s hair color. And no, the movie is not usually considered sexist.